Proposed building would feature a seven-story facade on Front Street and a twelve-and-a-half-foot-wide, four-story facade on Water Street. 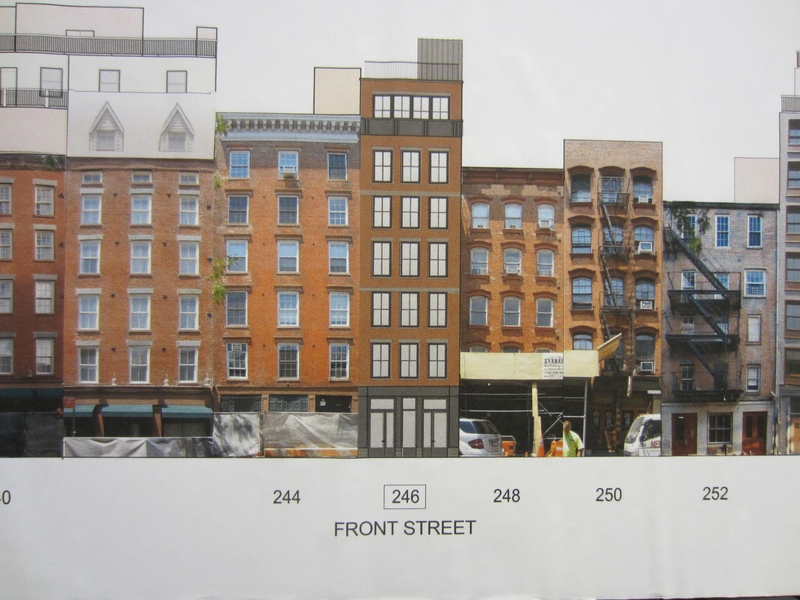 On July 24, 2012, Landmarks considered Andreas Giacoumis’s proposal to construct a new building on a vacant through-block lot at 246 Front Street and 267 ½ Water Street in the South Street Seaport Historic District. The lot has 20 feet of frontage on Front Street and twelve-and-a-half feet of frontage on Water Street. In 2003, Landmarks approved a proposal for the site from a prior owner, Werber Management. Werber subsequently obtained a variance from the Board of Standards & Appeals, but the project was never developed. Giacoumis’s new proposal retained the building envelope of the previously approved building to avoid having to seek a new BSA variance, but altered design elements and proposed materials. Darrin Krumpus, of Boro Architects, presented the plan. On Front Street, the building would reach seven stories and feature ground floor retail with apartments above. A narrow, single-family townhouse rising four stories would face Water Street. The ground floor would run through the entire lot, with a central courtyard to separate the two residential components. The Front Street retail entrance would be made with structural steel, painted black, and the upper stories would be clad in brick with granite lintels and sills. A projecting metal cornice above the sixth floor would match the height of the neighboring cornice. The seventh floor would set back eight feet. The Water Street facade would be built of black structural steel, with glass infill and zinc panels. No one testified at the hearing. Chair Robert B. Tierney stated that Manhattan Community Board 1’s Landmarks Committee recommended approval, but noted the proposal had not gone before the full community board for a vote. The commissioners generally responded positively to the proposal, with only minor objections. Vice Chair Pablo Vengoechea found that, because of its small scale, the all-metal facade on Water Street worked well “as an anomaly.” Commissioner Dina Chapin agreed, finding that the plan was “very approvable.” Commissioner Michael Goldblum found the Front Street facade was “perfectly tame,” but, while he found the Water Street side appropriate in concept, he said the window and infill pattern was too “generic.” Commissioner Libby Ryan found the seventh floor on Front Street “out of context” and said it should not be visible from the street. Commissioner Michael Devonshire agreed, urging the applicant to pull back the top floor. Devonshire also suggested altering the Water Street facade to reflect a better articulation of the zinc paneling. Chair Tierney asked the applicants to return to Landmarks, but said nothing needed to be radically changed. Tierney suggested setting the seventh story further back from the streetwall, and working with staff to refine the Water Street facade. LPC: 246 Front Street, Manhattan (13-2707) (July 24, 2012) (Architect: Boro Architects).